We have just opened our UK SMX Internet Marketing summit here at the Crowne Plaza in Birmingham. 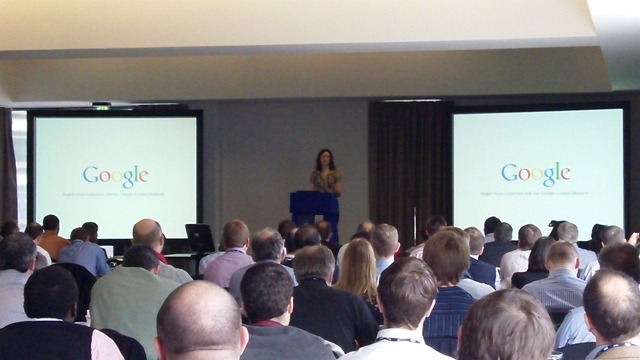 Sophie Toms presents the benefits of using the Google content network to grow a business. She presented how we can decide how we want to advertise our companies on relevant content networks that consist of 1000s of websites & blogs in the Google Network. An interesting statistic is that the average purchaser makes over 12 searches before making an online purchase. Content is a great way to compliment your search activity as it can deliver a good ROI for your business. The content network can reach over 88% of the UK market. Google also sells display & video ads on the content network. Businesses can hand pick the most relevant sites that allow you to target your market. Use placement targeting to handpick individual sites or sections of sites that you want your ad to appear. Good for branding & awareness is what placement targeting can do for you. Category targeting is where you advertise on specific broad range of sites like News, recruitment etc. Visitors to content network websites can see ads that are relevant to your products and match the contents of the page. Bidding can be done on cost per thousand, cost per click or cost per acquisition. With cost per acquisition you can set the maximum that you wish to pay to get a customer. Sophie gave a great presentation on how WSI Internet Marketing consultants can use the content network most effectively. She presented a step by step approach on how to use the Google Wonder wheel and the keyword tool to build your campaigns. There are over 1.5 m business that don’t have a website. Google is starting an initiative to get 100,000 businesses on line with a website. In May there will be a “getting British online week” and Google will provide tools to get more out of their websites. These are for the small SMEs who haven’t thought about getting online before. The message is to get online for free and get up & running in 20 minutes.